Melodies & Interludes, Vol. 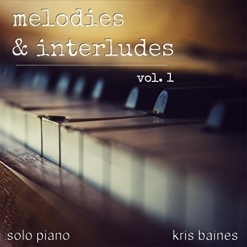 1 is a collection of original piano solos by British-born pianist/composer Kris Baines. Also a pastor and Bible teacher, Baines previously recorded three solo piano collections of hymns and sacred Christmas music that were released in 2002 and 2003. He started piano lessons when he was eight years old and later played keyboard for several UK and US bands, touring with them extensively. In 1998, Baines moved to New Zealand and taught more than sixty piano students as a full-time piano teacher. He has composed music for films as well as television commercials and programs. Melodies & Interludes, Vol. 1 is his first album of original compositions and consists of nineteen pieces that were composed over the past twenty years. 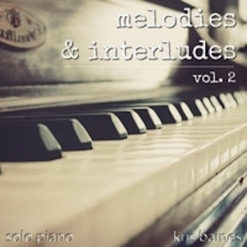 Obviously (from the title), Baines is planning a series of Melodies & Interludes, which is very welcome news, as his music is beautiful, soulful, and very expressive. It is interesting to note that some of the tracks are composed melodies while others are improvised interludes. All of them have a rather bittersweet quality that is elegant and very soothing. Melodies & Interludes, Vol. 1 begins with “Lila’s Journey,” one of the livelier pieces on the album and a lovely introduction to Baines’ music. “Almost Home” communicates a gentle sense of excitement and the happy warmth of returning to where you feel you truly belong. “Never Forgotten” is the first of the interludes and contrasts the previous more composed pieces with the freedom of creating music spontaneously. “Love Unfailing” is a favorite. It starts out quietly but earnestly, becoming more flowing as the intensity gradually builds to a passionate close. “Broken Dawn” is another improvised interlude and is a real heartbreaker. It’s amazing how much emotion can be expressed so simply and in less than two minutes! “The Pledge” is quite a bit lighter, but is equally sincere and heartfelt. The very melancholy “Far Away” expresses intense loneliness and sadness with an exquisite piano touch. “Remembering Poland” has a very Eastern European flavor with a few nods to Chopin here and there - I really like this one, too! The deep emotions expressed in “Letting Go (interlude)” stream from the heart of the pianist to the heart of the listener - gorgeous! “Resolution” is another favorite with its gracefully-flowing tenderness and honesty. “True Friends” seems to express love, happiness and gratitude in equal measure. Lively and upbeat, the strong melody could support lyrics, but really doesn’t need them. “Until Then (interlude)” is a sad and heartfelt goodbye followed by “Resting Place,” which is peaceful and hopeful, ending this beautiful album quietly with a soothing musical hug. I am really looking forward to hearing more music from Kris Baines in the future! His expressive style of composing and playing are a breath of fresh air! Melodies & Interludes, Vol. 1 is available from Amazon, iTunes and CD Baby as well as Soundcloud and other streaming services. Recommended!